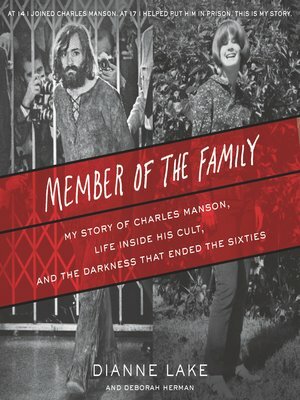 In this poignant and disturbing memoir of lost innocence, coercion, survival, and healing, Dianne Lake chronicles her years with Charles Manson, revealing for the first time how she became the youngest member of his Family and offering new insights into one of the twentieth century's most notorious criminals and life as one of his "girls." At age fourteen Dianne Lake—with little more than a note in her pocket from her hippie parents granting her permission to leave them—became one of "Charlie's girls," a devoted acolyte of cult leader Charles Manson. Over the course of two years, the impressionable teenager endured manipulation, psychological control, and physical abuse as the harsh realities and looming darkness of Charles Manson's true nature revealed itself. From Spahn ranch and the group acid trips, to the Beatles' White Album and Manson's dangerous messiah-complex, Dianne tells the riveting story of the group's descent into madness as she lived it. Though she never participated in any of the group's gruesome crimes and was purposely insulated from them, Dianne was arrested with the rest of the Manson Family, and eventually learned enough to join the prosecution's case against them. With the help of good Samaritans, including the cop who first arrested her and later adopted her, the courageous young woman eventually found redemption and grew up to lead an ordinary life.